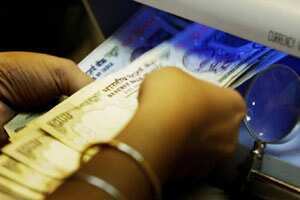 Mumbai: The rupee dropped on Thursday as oil importers bought dollars for making month-end payments and on risk aversion as doubts lingered over European monetary authorities’ ability to ease the region’s funding woes. Asian shares and the euro eased as doubts remained over how much of the funds banks raised from an inaugural long-term European Central Bank tender will actually flow into struggling euro zone economies and help restore confidence. Shares fell more than 1% early in the day after a rally in the previous session. “Equities have turned negative as global sentiment is jittery and there is persistent buying from oil importers, who, regardless of market conditions, have to buy dollars," said a senior foreign exchange trader at a state-owned bank. Oil is India’s biggest import item and, consequently, local oil refiners are the largest purchasers of dollars in the domestic forex market. Most traders expect any big slide in the currency to be checked by the central bank even as a widening trade deficit and slowing domestic growth put downward pressure on the currency. “The RBI has already cut space for traders to take positions and recent statements have put the market on notice, making sure nobody strays too far from the central bank’s line," the trader at the state-owned bank said. Some traders said the central bank had likely intervened intermittently in the local forex market this week after it sold dollars on 15 December when the unit touched a record low of 54.30. Subir Gokarn, a deputy governor of the Reserve Bank of India, said on Tuesday the central bank would use other measures to bring stability to the foreign exchange market.